Today on my lunch break I was watching a video on Funny or Die that a friend had sent me. Afterwards, I spent some time perusing the site until a lightbox popped up asking if I’d like to sign up for their newsletter. First off, this is a great tactic for growing your subscriber base. Chances are, if someone is spending time browsing your website, they may want to receive your email newsletter as well. 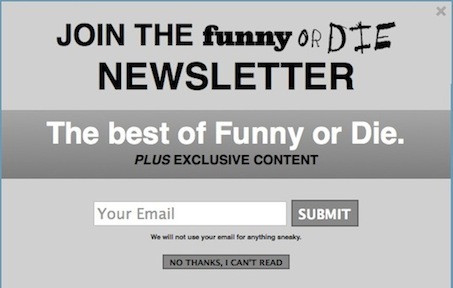 Second, not only do I sign up for pretty much every newsletter ever now that I work for an email marketing company, I especially am a fan of Funny or Die. Obviously I signed up. I immediately received their Welcome Message. This was good, because sometimes people forget signing up for a newsletter. I may be a little spacey at times, but even I couldn’t forget I’d just signed up for their newsletter. The Welcome Message was well designed and had great content. A large, colorful banner welcomed me. I had to laugh when I saw the message, headlined in large bold letters that said: WELCOME MESSAGE. I guess you can never be too obvious. The message also told me to expect the newsletter each and every week, no matter the weather conditions. That’s it. Simple, to the point, and just enough color and design to make it interesting. Sometimes people over think things. Funny or Die gave us a great example on how short and sweet can be just as effective, if not more so.